Widnes Vikings Magic Weekend campaign, supporting the Sir Bobby Robson Foundation, received a huge boost this week from Newcastle and England legend, Alan Shearer. Shearer, who is a Patron of Sir Bobby’s Foundation, not only pledged his own support to the Vikings ‘Tackling Cancer…I’m on it!’ campaign but also enlisted fellow England icons Gary Lineker and Ian Wright. The three lions of English football share a total of 176 appearances for their country and an impressive total of 87 international goals between them. They are household names and share a sofa most weekends on the set of BBC’s Match of the Day, where they were photographed pledging their support to the Vikings’ latest fundraising campaign in support of the Sir Bobby Robson Foundation. Last year the Vikings raised £20,000 for the cancer charity by donating profits from special Magic Weekend shirts featuring the Foundation’s logo. The jersey will once again carry the Sir Bobby Robson Foundation logo in place of its primary sponsor and the team will run out at St James’ Park wearing the shirts in May. A further donation will be made to the charity from the shirt sales, too. Alan Shearer, a Patron of the Sir Bobby Robson Foundation since 2009, says: “This is a fantastic idea to help raise funds to fight cancer and something I’m very happy to back. 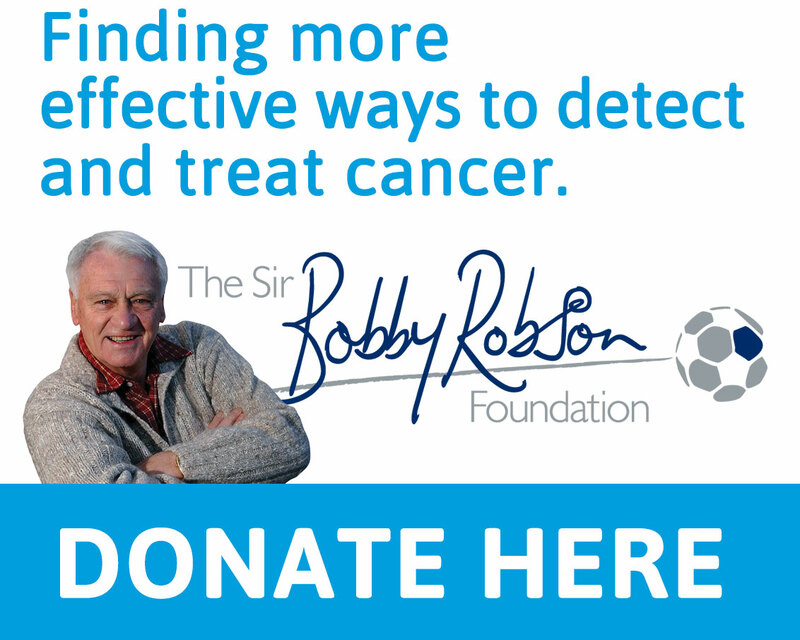 “Sir Bobby’s charity is pushing all the time for better ways to treat cancer and fundraising like this is very important. “I’m lucky, I’ve already seen my name on a football shirt at St James’ Park but I never thought I’d see it on a rugby league top. Launched by Kevin Keegan, the ‘Tackling Cancer…I’m on it!’ campaign is little more than a week old but Vikings’ director, Brian O’Connor, is extremely pleased with early interest and donations. Brian says: “In our first week alone, we’ve received almost one thousand donations to the #ImOnIt campaign and these have not only been from fans of Widnes Vikings but from Rugby League supporters nationwide and the North East public. “As I’ve stated previously, I believe that the Vikings were a part of something really special in 2015 and as a Club we really wanted to continue our relationship, not only with the North East public but with the Sir Bobby Robson Foundation who continue to carry out such important international cancer research. “The Foundation aims to turn the tide in the fight against cancer. This is an issue that the majority of people have experience either directly or indirectly and that makes our own initiative bigger than simply Widnes Vikings as a Club. It is something that the whole sporting community can buy into and be proud that they are making a real difference to so many lives in the UK and throughout the world. “If the funds raised through the Vikings campaign helps to save one life then it will be a success not just for the Club but for the Rugby League community. To pledge your support to the ‘Tackling Cancer…I’m on it!” campaign please visit https://www.gbnonline.co.uk/imonit.